His seventh novel is at the center of this conspiracy, one which set the stage once more for complex intent and intrigue rather than Ian Fleming’s more sensational derring-do with his titular character. While Smiley, George Smiley, is not quite up to jumping from tremendous heights, or into multiple beds with women he barely knows, the aging spymaster is certainly fluent in his craft, and dealing with “The Circus”. The British foreign intelligence service, even after detractors feel they can live without his like. 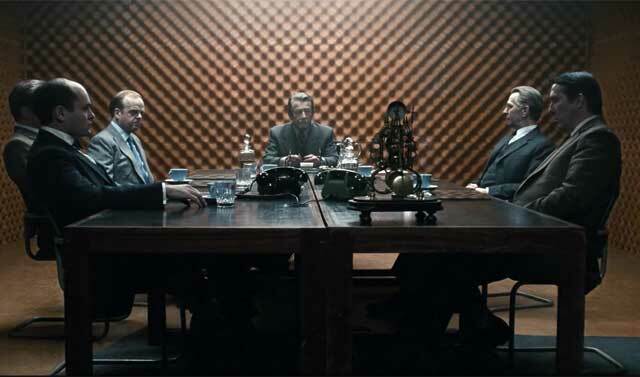 A brief synopsis of the film: As the Cold War snuck into the start of the 1970s, the head of British Intelligence, “Control”, resigns after a failed operation in Soviet-controlled Budapest. Also dashed was his firm belief “The Circus” has been compromised by a mole. One of the four upstarts in the service who’ve supplanted him in the aftermath likely a Russian agent. The true purpose the Hungary undertaking had attempted to solve. His faithful underling, George Smiley, forced into retirement with the headman’s ouster. Only later is George asked by a senior government figure to investigate the spiel whispered by a rogue agent that a sleeper does exist. Smiley always considered the failure of the Hungary endeavor, and the continuing success of Operation Witchcraft with its unnamed source of significant Soviet intelligence, suspect. Hence, the task of uncovering the traitorous spook becomes his. Interesting to return to this espionage tale after my first encounter with the material some thirty-five years ago. Then, through the award-winning 1979 BBC TV miniseries, starring Alec Guinness as our quiet hero. Stretched to almost six hours of public television viewing, at that. Offered an absorbing contrast to what Roger Moore (ahem) extended during the decade, to say nothing of the post-Watergate paranoia we faced on this side of the pond that Three Days of the Condor gave face to. Still, the elegance of Tomas Alfredson‘s modern adaptation of the now ancient Cold War particulars Le Carré laid out long ago resonate as only British storytelling can. Like a grand puzzle placed before you. Pieces in plain sight, the final picture nowhere near anything coherent; whatever beauty hidden by the seemingly innocuous clutter in front of your eyes. Its potential patiently waiting for the persevering to begin their journey of uncovering the mundane tidbits the sane always leave behind. This was a marvelous, if on the slow side, fabrication of life in the shadows of clandestine undercover work. The talented few ferreting out the real and the falsehoods between the nation states most of us live in. Those small everyday players bequeathed to carry out the government eavesdropping behind the scenes from their drab workrooms and lives, in the course of sound-proof room office politics. Way before they manifested into those damn humdrum cubicles many of us today call our second home. Unlike Bond’s exciting, globe-trotting exploits, Le Carré’s characters somehow connect with readers and movie audiences because they are more apt to reconcile themselves with these put upon souls, dealing with the vagaries of their work, even if it’s spy work. Besides, they know no one is ever going to hand them the keys to a DB5 with an ejection seat. Just never going to happen. Getting canned for screwing up the job, others craving your job title, let alone the petty jealousies, is just everyday for everyone. It’s the open secret of the world John Le Carré builds with his spy novels, I think, just with brilliantly conniving people doing the sparring. See The Imitation Game, if you don’t believe me. Damn, what is it about British film? I swear almost every year, they line up an all-star cavalcade of UK acting talent for such a work as this that makes similar American ventures look like ensemble excuses for overacting and vulgar scene-chewing (yeah, I’m look at you, August: Osage County). Here Gary Oldman, Colin Firth, Tom Hardy, John Hurt, Toby Jones, Mark Strong, Ciarán Hinds, and that cad Benedict Cumberbatch once again prove my point. Jeesus! 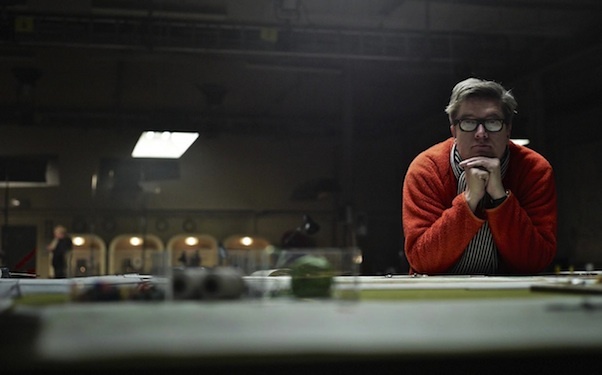 I admit, at first I had my doubts Swedish director Alfredson could pull it off. Not because of him exactly, 2008’s Let the Right One In being a masterwork, and all. But could the novel’s dense 355 pages, which took a few hours of miniseries form to translate previously, be distilled down to a modern-day feature-length film? Say with a 127-minute run-time. Screenwriters Bridget O’Connor and Peter Straughan proved it could, if you’ve the resolve to wait for un-Bondian gratification, that is. Leave this to the grown-ups in other words, maybe practice with PBS Masterpiece Theater in prep, if you feel the need. This a study of personal and public betrayal, along with treason, brought to a complicated light by gifted filmmakers. The antithesis of the spy franchise everybody and their mother knows about. Sure, it is convoluted, with a handful of subplots weighting it some. The film’s pendularly non-linear storytelling may prove to be too much for some. That’s not a bad thing, though. A John Le Carré story is almost always worth the early head scratching, especially in this, one of the best efforts to date. Still, don’t think I’ll ever get Gary Oldman swimming bare-chested, with other similarly pale Brits, in some dark brown water slough out of my head after this — no wonder they could conquered the world…for a bit. What an excellent post, I liked how this movie took its time to build up. Agreed, Vinnie. Took its time, but certainly paid off by the end. Thanks, my friend. Definitely paid off, such an intelligent spy movie. I really liked this version, albeit with some reservations. I’m not a rabid fan of the book so didn’t mind some of the modifications and had not problem following it, but a lot of my friends who have not read the book did – and certainly it’s a shame that the final shooting it left as an unlikely opportunity for the shooter (whereas in the books it was a planned meeting agreed to by the victim). Also, considering how much of the plot they chopped, I was surprised quite how much they left of the Ricky Tarr subplot – but I suppose if you get Tom Hardy you want to make the most of him! I like Gary Oldman in it, but really, really wish that physically he hadn’t modeled it quite so closely on the appearance of Alec Guinness in the TV miniseries. Despite these reservation, I think it works extremely well on its own terms. Nicely detailed and presented critique of a film made for a damp and rainy weekend afternoon. A well done period piece with a noteworthy cast. Though missing adequate back story to put it on the same level of the superior PBS miniseries from 1979. Mr. Oldman does his best to fill Alec Guinness’ shoes as Smiley. As the rest of the cast in filling their characters. Especially Toby Jones’ stand out take on smug, pompous. ridiculously out of his depth, Percy Alleline. And Tom Hardy’s hard luck, Rikki Tarr! Though Colin Firth came nowhere close to Ian Richardson’s carefree, traitorous mole, Bill Haydon. And Kathy Burke was small beer compared to iconic Beryl Reid’s historian and “Russia Watcher”, Connie Sachs. Also waited patiently for Mr. Oldman’s Smiley to polish his glasses with the fat end of his tie! To no avail. Also waiting patiently to see if Patrick Stewart will reprise his role as Smiley’s “Opposite Number”. The silent, scheming “Karla” in the proposed sequel, “Smiley’s People”. Yes, the miniseries offered such a rich tale. Always wished Patrick Stewart’s Karla would make an appearance in other things. Course, he did make a formidable villain in “Conspiracy Theory”, though channeling former spook, and later CIA director, William Colby more than the Russian spymaster. Great comment, my friend. Many thanks. Fantastic review, Michael. I found I had to be in the right mood to appreciate it fully, but the cast, the script, everything was heavy and nicely done. Lovely review! I was partway through a re-watch and then puppy. (How long can I use that excuse? hehe) So when I went back to finish I realized my internet provider had turned off global mode (this was not a surprise I just forgot the date, other online streaming suppliers here in NZ were going to sue them, the whole thing was so stupid) and the movie isn’t in the NZ Netflix catalog… so now I have to find another source. Anywho… I have seen this one before and what I remember thinking the first time was that it was excellently done but a tad slow. I think that comes from the book having so much exposition which doesn’t always translate well to the screen. By the way, did you read any part of the book? I only wonder because I thought the opening of the movie was really clumsily done when what actually happened in the book was not only better but way more exciting. Oldman is sublime here; as good as Guiness in the Beeb’s incredible mini-series (an absolute must watch) while that supporting cast is one of the best you could hope to assemble. I loved this; a brave film that’s more about men trying to work each other out than spying. Yes Oldman is indeed excellent, and the cast in general is impressive. I only saw this once in the theater upon the release three years back, but was reasonably impressed. Alberto Ingelsias’ score is terrific too. This is about as comprehensive a review as I’ve read on it! Great work Robert!